Product prices and availability are accurate as of 2019-04-23 01:34:26 EDT and are subject to change. Any price and availability information displayed on http://www.amazon.com/ at the time of purchase will apply to the purchase of this product. 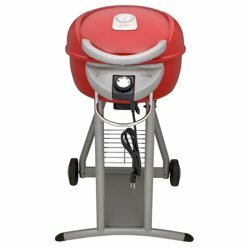 There is nothing more summery than a backyard barbeque, but if your yard is the size of a thimble you need to figure out a way to keep that summer tradition going strong. Now is the perfect time to get the Char-Broil TRU-Infrared Patio Bistro Gas Grill. With a 240 sq. in. total cooking area, you will be able to cook your heart out! 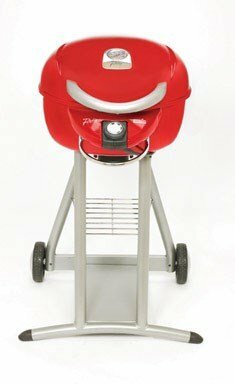 With its smaller stature, this grill is great for any size backyard or any intimate settings. 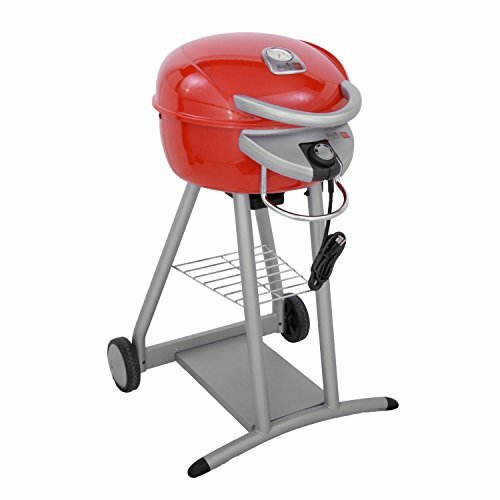 320-square-inch total cooking surface (red model shown; view larger). 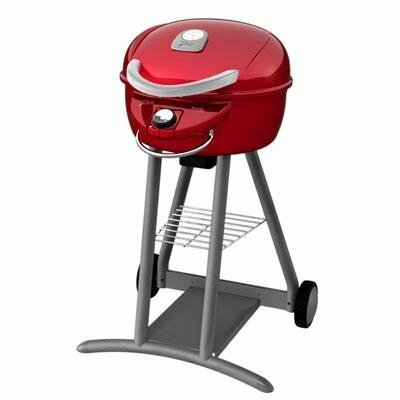 Enjoy big grill features with the compact Char-Broil Patio Bistro electric grill -- perfect for apartments, condos, balconies, and smaller patios. It features Char-Broil's award-winning infrared cooking system channels heat evenly to the cooking grate, eliminating hot and cold spots. 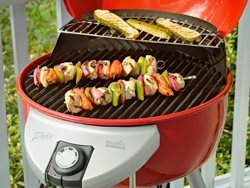 A precision dial gives you complete command over the 1750-watt electric burner for your cookout favorites. Plugs into any 120-volt outlet (view larger). The Patio Bistro has a 240 square inch porcelain-coated primary cooking surface and an 80 square inch raised secondary cooking surface. 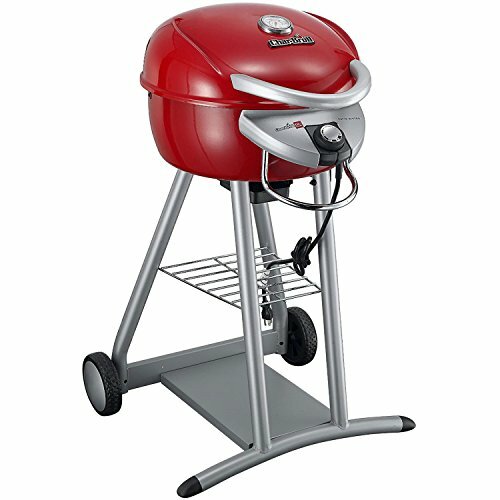 Its 320 square inches of total grilling surface, large enough to accommodate 8 to 12 hamburgers. 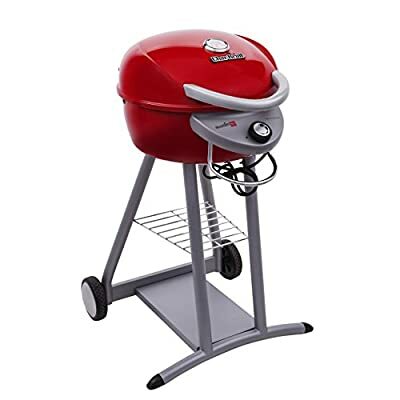 It features a temperature gauge on top of the hood for at-a-glance monitoring of the grill's temperature, a cool-touch handle, easy-to-clean porcelain-coated grill body, and a storage grate to keep your tools close at hand. 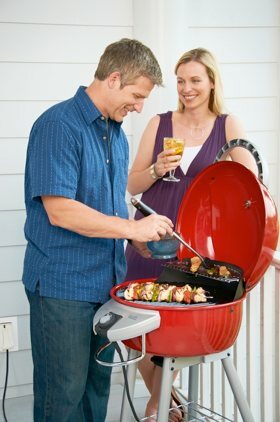 When the grilling's done, simply wheel it away for easy storage. The Patio Bistro plugs into any 120-volt outlet. It measures 24.4 x 25.2 x 38.2 inches (WxDxH) and weighs 54 pounds. All Char-Broil TRU-Infrared grills generate a minimum of 65 percent infrared heat, which is evenly spread across the entire cooking surface to cook food -- without drying -- at temperatures that range from simmer to sear. Unlike traditional gas grills that use convective heat (hot air) to cook food, Char-Broil's TRU-Infrared grills limit the hot air flow and use natural, radiant heat to cook food directly without drying. While convective heat destroys food's moisture barrier, infrared heat penetrates it without drying and locks in natural juices and flavors. Char-Broil's TRU-Infrared cooking system virtually eliminates flare-ups while producing very even heat (no hot or cold spots). Ideal for balconies and smaller patios (view larger).